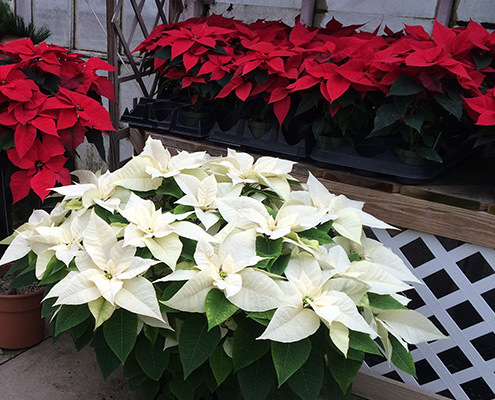 Christmas | Kollman’s Garden Center Twinsburg Ohio the Area’s Source for Poinsettias for Churches and Fundraisers. 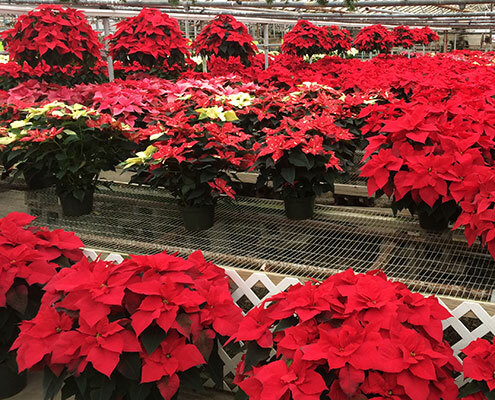 Nothing says Christmas quite like a Poinsettia. And Kollman’s says it in many different shades. The colors speak for themselves. 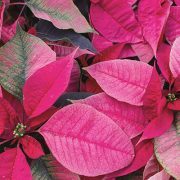 Each year we grow several new varieties to test their color intensity, bract size, and durability. The winners will be grown again. Come see what’s new this year! Rounding out our selection of seasonal plants is the traditional Christmas Cactus in vivid hues of pink, salmon, white and red. Cyclamen are showy plants with long-lasting blooms shooting straight-up from the center of the plant. 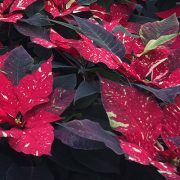 They are offered in the holiday colors of red and white. Amaryllis in white, pink or red is a dramatic alternative that will complement any room. An unusual addition to our selection is the Hydrangea. The huge, white snowball blooms bring a fresh alternative to decorating. And it wouldn’t be the holiday season without Paperwhites. We offer the bulbs in packages of 5, perfect for growing in a shallow dish, bringing a sweet fragrance into your home. 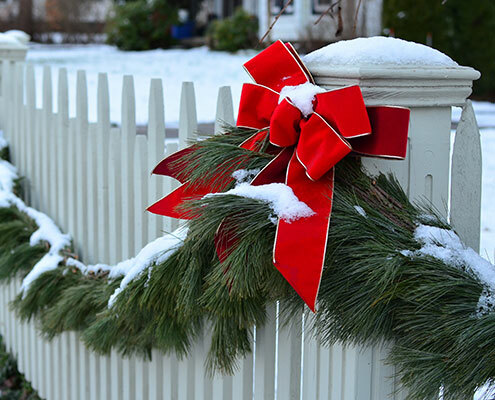 Popular uses for our garland is to swag around doors and windows, loop around fencing, wind-up light posts and wrap-around banisters. Whether using White Pine, Princess Pine, Fraser Fir or a fragrant, mixed garland of Cedar and Douglas Fir, decorating with roping is an attractive way to bring out the holiday spirit in all of us. 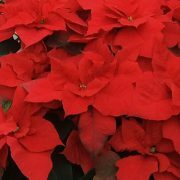 We offer bunches of various greens for the home decorator to enhance mantels and windowsills, or to use in arrangements for tables or holiday containers. Incense Cedar, Noble fir tips, blue-berried Juniper, White Pine tips, Boxwood, Shore Pine, Western Cedar, and Fraser Fir and Douglas Fir boughs complete our selection of loose greens by the bunch. 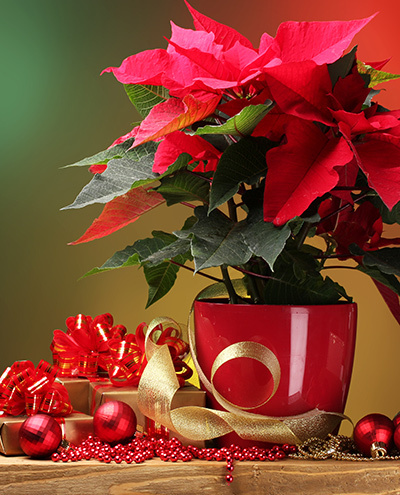 We supply holiday flowers to many churches in Northeast Ohio. If your church is looking for a new supplier please give us a call. We deliver all across Northeast Ohio, and work with you on timing for delivery. Flowers that are direct from the grower will last longer and you’ll be supporting a small business in your local community. 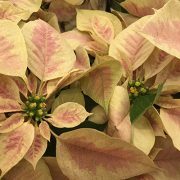 Kollman’s is one of the leading Northeast Ohio area suppliers of Poinsettias for churches and fundraising organizations. We welcome special orders from churches and fundraising organizations, as well as non-profit fundraising organizations. Please feel free to contact us about your special needs. Our assortment of wreaths ranges in size from 10in. to 48in. in diameter. The mixed wreaths from the west coast are most popular, made from several different greens, and adorned with juniper berries, incense cedar and pinecones. Our Noble Fir wreaths are dense, with rich, dark green color, and enjoy a long life without dropping needles. 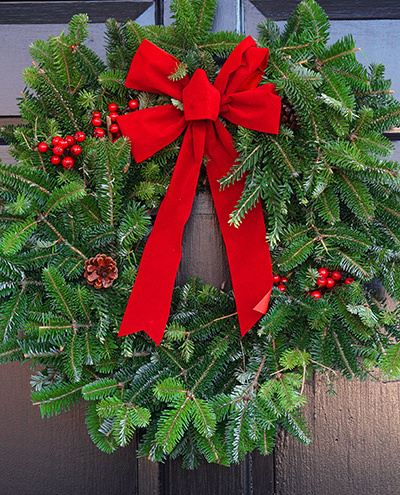 Fraser Fir wreaths are a favorite because of their natural fragrance and full, bushy shape. Boxwood wreaths lend a sophisticated, traditional feel to any doorway or wall. 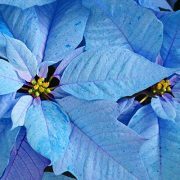 Swags for doorways, and window swags with natural decorations are an alternative to the traditional use of wreaths. Put together a basket filled with your gardener’s favorite tools and accessories. Or select a gift from our display of Christmas Ornaments and accessories. A new clay or ceramic pot, or garden sculpture is always a welcomed gift. And if you just can’t decide, Kollman’s makes it easy with a Gift Certificate good for a year on any purchase! Place it in a bright area away from direct cold or warm drafts. Keep daytime temperatures at 65 to 70 degrees. Keep nighttime temperatures at 60 to 65 degrees. Water when soil becomes dry to the touch. Fertilize the plant once a month. Serving Cleveland, Akron, Youngstown, Twinsburg, Solon, Hudson, Macedonia, Aurora and Surrounding Communities. Retail: Closed while we grow for spring.